As with any personal interest, the more we know about what we collect, the more we enjoy it! Certainly with the availability of items designed by William Spratling and their increasing cost, it is more important than ever to be able to evaluate those items of interest. There are very few sellers who would deliberately mislead, but it is unreasonable to expect dealers to be experts in every area of merchandise they sell. We often find Spratling treasures in flea markets, estate sales, and auctions where we must depend upon our own ability to judge the merits and authenticity of a piece. What should we look for? Are the hallmarks appropriate to the design? (Are 1930s - 1945 hallmarks on early designs? Are 1949 - 1967 hallmarks on later designs?) Knowing the difference between the two is often the easiest way to discern copies! Spratling Silver: A Field Guide is organized by design periods so that it is easier to learn which are "early" designs and which are "later designs." Is the construction appropriate for the creation of the item? While some items produced in Spratling's workshop were not as finely crafted as others, there was a fairly high level of workmanship required before "maestro approval" was obtained. Construction features of each design period are pictured and discussed in Spratling Silver: A Field Guide. Are there appropriate signs of wear, usage and polishing? Remember, the most recent Spratling objects were made at least 36 years ago, and some were made 72 years ago. Very few items have been packed away for 36 - 72 years and never used! CAUTION: Spratling designs and hallmarks have been copied for more than 50 years. Study the information below so you will know what to look for! HALLMARKS Successful designs of jewelry and objects were always copied, and although a design may be a "Spratling" design, unless it is authentically hallmarked as such with a Spratling primary hallmark of the correct period, or there is irrefutable documented provenance, it cannot be considered as having the same value as an appropriately hallmarked piece. 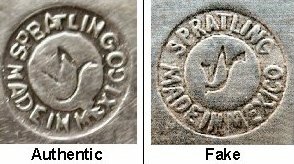 Hallmarks, however, can be added or newly created, so it is essential that we look beyond the fact that a Spratling hallmark appears on the item. 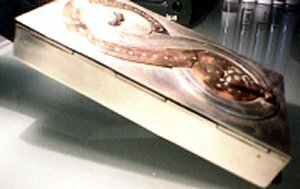 (It is even possible to photograph "correct" hallmarks and have dies made that will reproduce the photographed images on non authentic items.) It is important to remember that the lettering on each of the authentic Spratling hallmarks was hand done. Therefore we find an irregularity in the spacing and placement of the letters, particularly in the WS Print Circle hallmark (photo on the left.) There are copies on the market today wherein the lettering on this hallmark is so perfect and regular it appears to have been created by a machine as in the "fake" hallmark on the right. In the WS Print Circle mark, the letters surrounding the circle were raised while the WS in the center was incised (cut into) into the silver. The Spratling Silver letters were raised in the oval cartouche. (The photographs do not always adequately show the difference between the incised and raised letters.) More examples of Spratling silver are appearing on the market with a WS Print Circle hallmark in which the center letters, "WS" have been stamped more than once thus blurring the center part of the image. These marks are highly suspicious since the entire hallmark stamp (punch) was a single unit. Therefore, if the center letters were struck twice the letters on the outer rim should also have been struck twice. On some of the examples we are seeing now, only the center is struck twice. (It is true that entire stamps were sometimes moved in the process and thus, two overlapping marks are created. But the entire mark is affected - not merely the center letters.) Spratling used a variety of hallmarks (each with a fairly definable time span), and so we need to assess whether the design of the specific item in question correlates with the time frame that particular hallmark was used. For example, most of Spratling's jewelry incorporating copper or bronze were made prior to 1946. If you refer to the section on this website Hallmarks - What Do They Mean? you will see that the primary hallmarks WS Print, WS Print Later, WS Print Circle, and Spratling Silver were used during the time frame circa 1933 until circa 1946. Therefore we would expect to see one of these hallmarks on a Spratling piece which incorporates copper or bronze. Another example of the relation of hallmarks to Spratling design and period of production is that we should be concerned if we find a design we know was made only after 1950 if it has a circa 1940 - 1946 hallmark. The dragonfly pin shown on the right would be of concern if it had a hallmark like that pictured above on the right. Instead, the dragonfly pin should have one of the hallmarks used during the 1950s and 1960s. See the Hallmark section for more information and photos of those marks. DESIGN Spratling designs have a bold clarity that is consistent throughout the entire 1931 - 1967 period. His early designs reflect ranch "rope" patterns, straps, and designs with heavy incised carving or cut out work based on pre-Columbian motifs. Spratling also created a distinctive, light weight repousse body of work representative of stylized pre-Columbian and Hispanic motifs. By the early 1940s Spratling combined many of his silver designs with native stones and materials thus creating surface and textural contrast. After 1947, his designs became simpler with greater emphasis on line, surface, and the interplay of light and shadow. He combined indigenous materials of strong contrast with silver so that he could further emphasize the sculptural lines of his refined design ethic. In the late 1940's Spratling was working on his project to train young Alaskan men to fabricate silver to be used in combination with their own indigenous materials, and as a part of that project, Spratling created 200 protoype models. Although the project never developed beyond the initial training of 7 men in 1949, Spratling had visited Alaska a number of times and was impressed with the similarity of early cultures among the Alaskans, Northwest Coast Indians and pre-Columbian civilizations. A significant number of Spratling's designs created during this period are influenced by this "Alaskan experience." In the late 1940s, 1950s, and 1960s he created many designs executed in gold and other materials that reflected ideas inspired by his time spent in Alaska. He also continued to produce jewelry combined with ebony and pre-Columbian jade. Throughout the evolution of Spratling's design spectrum, several themes are ever present. The use of applied and inset circles (of both silver and other materials), the depiction of animals and birds, and the use of a single or clasped hands as a design element can be found in every one of Spratling's design periods from 1931 until his death in 1967. MATERIALS USED A study of Spratling's catalogues and writings clearly shows that he favored the combination and use of specific materials at various periods in his designing career. This too, can be additional confirmation in assigning date ranges for a specific item. Extensive information and photos of designs with the materials used in each design period can be found in Spratling Silver: A Field Guide. (Notice the hinge on the finely crafted box - c. 1949 - below on the right in contrast with the cruder hinge from a c. 1940 box depicted in the photo on the left.) Some Spratling pieces are beautifully and finely constructed. Other examples of the same design may lack the finely finished touches or the fastidious workman ship. This is one of the charms of individually crafted pieces; no two are truly alike. Certainly, however, the piece that was created with greater attention to the fine details will always remain a more valuable piece over the same design that has been finished in a cruder fashion.. WEIGHT Pieces created by hand will vary in weight and in size. Some designs that were made over a period of time may have been modified to reflect customer preferences. The design specifications, therefore, may result in a slightly lighter or heavier piece. If however, there is a considerable decrease (or increase) in weight in combination with poorly executed details in a piece, we should seek additional evidence of authenticity. Collecting is more than merely finding an item to purchase. It is an ongoing study, an evaluation...a learning process. When our passion is the collection of hand created works of art, we must learn to identify the clues that each piece provides. The total consideration of that resulting story of clues enables us to collect with confidence and provides us an enriching experience whereby we become a little closer to the genius of talented designers and artisans.